Pioneers in the industry, we offer mini bitumen sprayer from India. With our in-depth knowledge and vast experience, we are offering a comprehensive assortment of Mini Bitumen Sprayer. The offered bitumen sprayer is manufactured using the highest grade basic material and advance technology. Our bitumen sprayer is comes with burner, engine, bitumen pump. 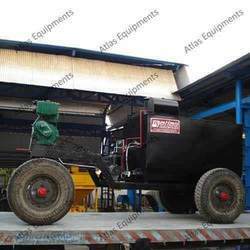 We offer this bitumen sprayer in numerous stipulations and can be customized as per the needs of the patrons. The tank is fully insulated on all sides. The sprayer comes with inbuilt burner, diesel engine, air compressor and bitumen flow pump. Looking for Mini Bitumen Sprayer ?